Hello Knitting and Crochet Blog Weekers! I don't know that I'll get something posted every day for this but I thought today's topic was interesting. When I look through my stash (both used on Ravelry and waiting to be used) I see a lot of reds, plums, fuschias, wines.... I knit some for me and lots for others and I gravitate towards buying, spinning and knitting these colors. What's really interesting is that I wouldn't call these colors my favorites at all. I don't dress in these colors. I tend to focus on neutrals: browns, black, khaki, etc. when I buy clothes. What about you? 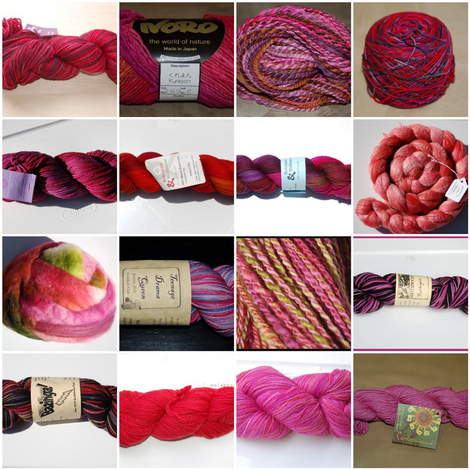 Do you buy yarns in predominantly one color family or do you buy in rainbows? In quilting and fabrics I think I branch out much more color-wise. I tend to wear dark colors -- black, navy or deep forest green. But my socks? They are ALL over the rainbow and beyond. Look at all those pinks and fuschias! Funny that you don't wear those colors...I do buy yarns mostly in the colors I wear. That's one of the prettiest stashes of pink I've seen. How funny.. I tend to buy colours I am more likely to wear, but purpley colours seem to come out tops for some reason. I've got a lot in my stash to use up, hopefully next winter my wardrobe will be a bit more varied in colour! This page contains a single entry from the blog posted on April 23, 2012 10:27 AM. The previous post in this blog was A Whole (Retro) Flower!. The next post in this blog is Winner, WInner, Chicken Dinner!.